At first I wasn't quite sure what to make of this week's episode of Glee. But the more I thought I about the more I decided while I may not have liked everything about it there a few things that came together quite nicely in the in. When Mr. Shue decides to hire Jesse Saint James, former Vocal Adrenaline member as the Glee Clubs' Show Choir Consultant it leads to nothing but trouble. He forces Mr. Shue to hold a competition to see who will be singing the solo at Nationals. Of course, Jesse thinks Rachel is the best; However, in the end what was neat about the whole competition is that it has brought everything full circle. After Mercedes performance Mr. Shue comments, "Thank you for doing that song Mercedes. It reminds me of when you first audition and how good you were then and it shows me how far we've come. " When all is said and done it is decided that the Glee Club will write more original songs for their Set List at Nationals. Also, in this episode we come to find out that Sue's sister who has Down Syndrome has passed away. Sue has trouble dealing with this as she was so close to her sister and the club offers to help plan her sisters' funeral. The club performs a sad but great rendition of "Pure Imagination" from Willy Wonka. Lastly, there were two big surprises thrown at us as the Season winds down. First, after Finn breaks up with Quinn we find out that she has something up her sleeve planned for NY and so does Mr. Shue! It's turns out that he is going to perform in April Rhodes show after all and has no intention of telling the kids since he plans on returning to school in the Fall anyway. Now onto the music. Although this episode took a while to bring us the tunes what I found cool about it was that it was like the very first episode when everyone auditioned. 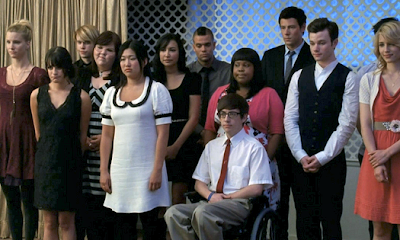 It was neat to see some of the cast perform individually but as Mr. Shue pointed out they are MUCH better a whole unit. Some of my favorites from this episode were Santana's "Back to Black" by Amy Winehouse and of course Mercedes "Try a Little Tenderness" by Otis Redding ( I just love that song!). I give this ep. a C+, it was sad but had some great songs! **Check out all the performances after the jump!